Thermoplastic ball valves, TBH Series. throughout many industries. Like most valve types, the ball valve is named for its closure mechanism. A spherical shaped element is placed in the fluid flow path, with the ability to rotate its position around an axis. 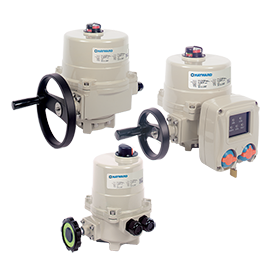 The axis is a shaft or other device that connects to an actuator on the exterior of the valve. The actuator can be a simple handle or an element of a valve automation system. 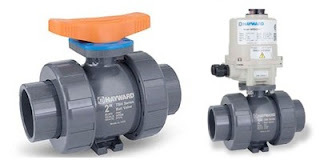 The “ball” in the ball valve has an opening through its center, usually round to mimic the shape of the connected pipe. As the ball is rotated, the opening aligns with the inlet and outlet of the valve body, allowing fluid to pass. A counter-rotation that aligns the port (opening) with the sides of the valve body, away from the flow path, stops the fluid flow. A seat between the exterior surface of the ball and the containing valve body prevents fluid from flowing around the ball. The basic ball valve design centers around either a floating ball or trunnion mounted ball. A floating ball valve uses the body and the seats to hold the ball in place, with the connecting shaft serving primarily as the rotating mechanism. This design can provide bidirectional closure, since the fluid flow seats the ball against one of the sealing surfaces. A trunnion mounted ball valve has positioning support pins that mate with machined portions of the valve body to hold the ball in place and serve as the axis of rotation. Trunnion valves are available in sizes larger than those of the floating ball design. Various common and exotic metals are routinely used for body and internal construction. Thermoplastic ball valves are an alternative that provides high levels of corrosion resistance to the media, as well as the surrounding environment. Some detailed information about thermoplastic ball valves from Hayward Flow Control is provided below. There are more variants to fulfill a wide band of applications. Share your fluid control challenges with a process control specialist and leverage your own knowledge and experience with their product application expertise to develop an effective solution.